The kind of special features for rating the game includes activating the Rob the rich feature, a mini interactive game where you have to choose 3 out of 18 cash bags to reveal prizes which can be obtained when all missions are completed. This is the way to get Multipliers between 2x and 25x or up to 6 additional picks. An empty bag takes you to the base game. Is it possible to play The Wild 3 on my mobile device? It is very possible for you to play online using any mobile device on various NextGen Gaming sites and it does not require the download of any application on your mobile device. What is the RTP factor of The Wild 3? The information on the RTP rating will soon be officially announced. Multiplying your winnings and earning additional picks to boost your bankroll up to the maximum jackpot is very possible even though it is very unlikely for you to get any standard of The Wild 3 free spins. 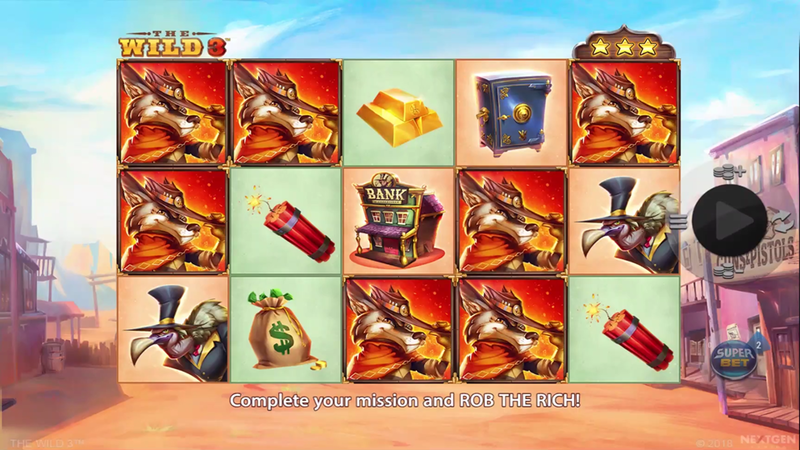 The Wild 3 is a Wild-West-themed adventure and game built based on a 5-reel 3-row 10-payline slot machine released in summer 2018 by the NextGen. This is a lot of fun and players and is based on different levels where you earn Sheriff’s badges by completing 3 unique The Wild 3 Bonus games including Lock n’ Load and Any 5 of a Kind. Also, there is an ultimate Big Win for players if you score high by simply using a proper betting strategy. After reading The Wild 3 slot review, you can Learn how to win and get some tips to help your progress.